Furuvik is a small amusement park and zoo on Sweden's east coast, which is now home to Alton Towers' Black Hole. Furuvik Zoo sits on the shore of Sweden's east coast, and came to worldwide attention a few years ago when it was discovered that one of its chimpanzees was pre-planning attacks on visitors, stashing stones ready to throw at them and providing evidence to suggest that forward planning was not a purely human trait. 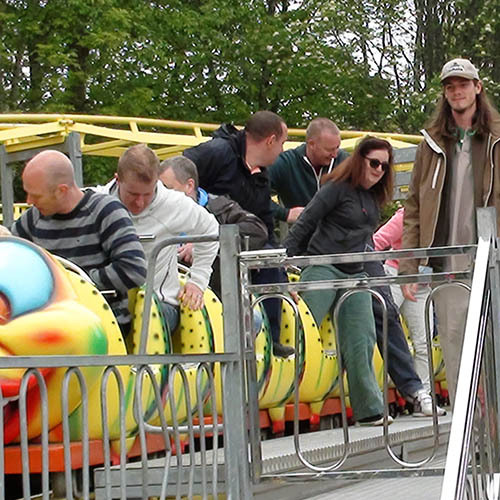 The zoo, however, came to the attention of the international theme park community a couple of years after that, when they acquired the former Black Hole rollercoaster from Alton Towers. This classic Schwarzkopf Jet Star 2 has been restored, repainted in a vivid red and blue colour scheme, brought out into the light, and renamed Rocket. For people who used to ride the coaster in the dark Black Hole tent, it is a pleasure to ride it outside and see the superb job Furuvik have done in bringing it back to life. Alongside Rocket, Furuvik's Tivoli amusement park section has a selection of flat rides and, new for 2017, a Family Boomerang coaster from Vekoma called Fireball. Furuvik is a nicely kept park, and is well worth a trip if you find yourself close by. The shoreline setting is beautiful, and the zoo is also well presented.